Why bother to get into these unchartered waters of human anatomy and grind away at cosmetic studies? Well, the response is obvious, dear friends. Knowledge is the power; and knowledge of the nature of our own body is the key to understanding the mechanisms that control the regeneration and recovery processes of innate resources. Everyone should study the principles of work performance in the skin, at least in general terms. This is the way we can save the treasure given to us by the nature. Alas, customers can easily fall for tricks of cosmetics manufacturers and beauty centers. It is increasingly evident that using the cult of "instant beauty" they often pursue the only goal, their own profits. Let's learn together and evolve from the level of the ordinary consumer to the level of a prudent and informed buyer, avoiding glorified and merchandized yet another "magic lotion made of pink unicorn mane". The load of responsibility for our health rests on our shoulders. Our skin is the outpost that protects us from the misery of the environment. How is it arranged? Human skin is a very complex organ. It consists of three layers: epidermis, dermis and subcutaneous fat. Talking about the face, there is one more layer, which is not related to the skin formally, but it plays a very important role in cosmetics and in interpersonal communication. This layer is called facial muscles. All these layers constitute the various kinds of tissues: epithelium, connective and adipose tissues. Each layer contains a large number of cells. In the dermis there are differentiated (i.e., having specialization and working in the body on its own "service instructions"), and the so-called stem cells, undifferentiated and capable to develop into different cell types under certain circumstances. Another unique feature of the skin is that it employs living cells, intercellular substance (a kind of "gel" that fills the space between the cells), and dead cells (horny scales) in a friendly alliance. Therefore, in cosmetology a positive effect can be achieved on two fronts: affecting nonliving matter (i.e., upper stratum corneum and intercellular substance), or working with live cells in the deeper layers, and achieving a slow but steady positive rearrangements in their work. Each cosmetic product or therapeutic method has its own "target effects" in the skin structure, so our goal is to understand the mechanisms of their work, whether it is homemade scrub or serious and expensive course of therapeutic procedures. Let's arm ourselves with an imaginary microscope and examine each layer of the skin in more detail. Epidermis is mainly composed of a single cell type called keratinocytes. The bottom of the epidermis is called the basal membrane, and on the surface there is the horn layer. This uppermost layer of the skin regenerates constantly, because it was the first to assume the aggressive beats of the environment. Keratinocytes, being born in the basement membrane, gradually move up and take the place of overage cells. That happens so smoothly and orderly, that within the epidermis it's able to distinguish the individual layers of keratinocytes in various stages of development or maturation. In the course of their movement from the basal membrane to the surface living cells gradually die and lose their nucleuses. After reaching the top layer, these dead cells - now they are called by different name, corneocytes - form the stratum corneum or horny layer. That is the same microscopically thin film that forms the blister in mild burns or abrasions. The cells of the horny layer under a microscope look like a mosaic of tightly interlinked hexagonal plates. The "glue" that holds together these parts of the mosaic and ensures the integrity and strength of the horny layer is called the lipid barrier. In fact, the corneocytes, these translucent flakes perform the same function as the bird feathers or lizard scales: they protect our inner environment. Every minute, thousands of dead flakes get lost from the skin surface and get into the surrounding atmosphere. Those tiny airborne specks of dust that we can see in the beam of a bright light, are 90% skin particles. The basement membrane, connecting the epidermis and dermis, is a thin plate, which contains the elementary cells, the stem (undifferentiated) cells, as well as Largerhans cells ("security guards", preventing the penetration of harmful substances and organisms to the dermis), and receptor Merkel cells ("hormone factory", which is responsible, in particular, for the production of endorphins). It also serves as an additional filter, which is limiting the penetration of foreign substances into the dermis. The basement membrane is easy enough to damage; for example, during deep peeling procedures some complications such as scarring can occur. Fortunately, nature has provided additional security: the membrane is not homogeneous in its structure and has recesses and protrusions, so if the skin surface is damaged due to trauma, there is a possibility of further recovery. This layer is responsible for elasticity and strength of the skin. Dermis in its structure can be compared with elastic mattress, which rests on the epidermis. It is laced with longitudinal and transverse "springs" - collagen and elastin fibers. The space between them is filled with a special gel-like substance, composed essentially of hyaluronic acid. The key property of hyaluronic acid is the ability to bind water. The structure of its molecules resembles a fishing net with a large number of meshes, which capture the water molecules and turn them into a viscous gel. Each "net" can hold between 200 and 500 water molecules. This entire "catch" of the water is used by the body for the synthesis of new cells and output the decay products and toxins. The regeneration of the skin is a continuous process, and, like in any industry, water plays a key role. The elasticity of the skin and its resistance to the physical impacts directly depend on the amount of collagen, elastin and hyaluronic acid. The role of "mid-level managers", who are responsible for the synthesis of these elements, is performed by connective tissue cells called fibroblasts. These cells monitor both the production of new components of the dermis, and the well-time destruction and disposal of worn-out components. Research figures that with age, the activity of fibroblasts decreases, and synthesis of new materials for dermis results slower than its destruction. Therefore, the skin does not have enough time to get recovered and starts to age. Blood and lymphatic capillaries and vessels play the role of the transportation system, which supplies oxygen and all the necessary components to the dermis, and removes the waste products of metabolism. The epidermis doesn't have its own blood-circulatory system, so the condition of the top layer depends on "delivery" from the dermis. To maintain the intensity of the blood flow in the dermis, and, thereby, to preserve the beauty of the skin, you need to perform treatments that strengthen the walls of blood vessels and improve blood circulation. These health precautions include conditioning physical exercises, facial gymnastics, contrast shower, massage and use of natural cosmetics that contain rosemary, geranium, neroli, chamomile, lemongrass, calendula, etc. Therefore, although the dermal layer and not visible from the outside, keeping it in good shape is the key to radiant skin and healthy complexion. This soft lining, located directly beneath the dermal layer, is composed entirely of fat (adipocytes) and designed for thermal insulation of the body and damping of mechanical injuries. It accumulates fat-soluble vitamins of groups A, D, E and estrogen hormones. Adipose tissue has an extensive network of blood vessels, designed for instant control of the levels of fat in the blood. Pathologies caused by unhealthy lifestyle and nutrition, such as excess fat in cells, thickening of the septa between fat lobules, swelling, inflammation, and others may very negatively affect both the skin beauty and overall health. Facial muscles of expression are not related to the skin layers directly, but they are associated with the skin more closely than the rest of the body muscles. In addition, the facial contours and youthful appearance in general directly depend on the tone of facial muscles. Therefore, we will briefly describe them. There are 57 facial muscles. 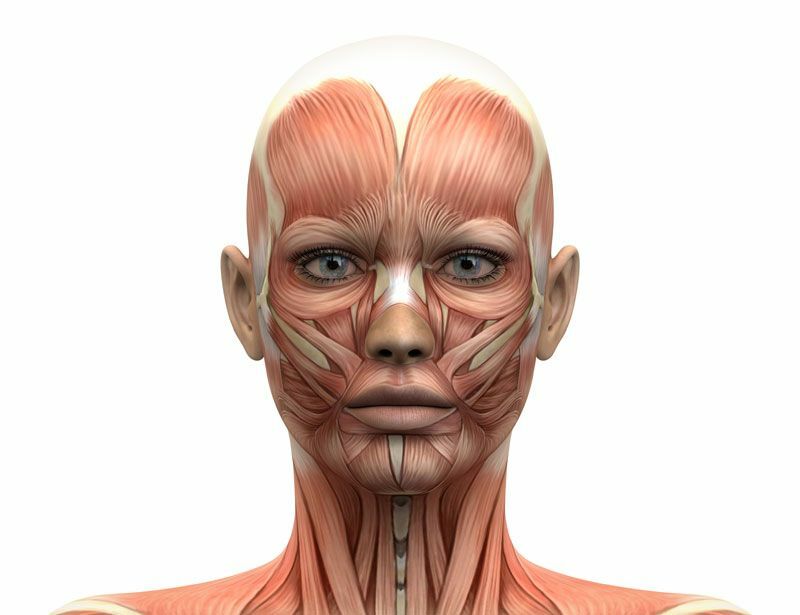 One end of each muscle is fixed to the cranial bones, and the other end – to the face skin or to the surrounding muscles. When the muscle is contracted, it pulls the skin, causing changes of facial expression: puckering of the eyebrows, forehead wrinkling, lips stretch into a smile, etc. The only exceptions are the mastication muscles, which, like the body muscles, are attached to the both ends of the bones. In fact, a human face (as well as the body) visually looks old if muscular system loses its tone and begins to "sag". Skin folds in the active zones is the result of the tension of the skin during muscle contraction. While organism is young, such dislocations do not form skin defects, as its renewability is much higher than the speed of decomposing of its structural proteins (collagen and elastin). In course of time, the synthesis of collagen and elastin becomes less intense, and their destruction is all the more critical; in turn, face and neck muscles are deformed in constant hypertonia (or hypotonia). As a result, in these areas wrinkles appear. However, facial and body muscles are amenable to training, and they can become more elastic and strong again. 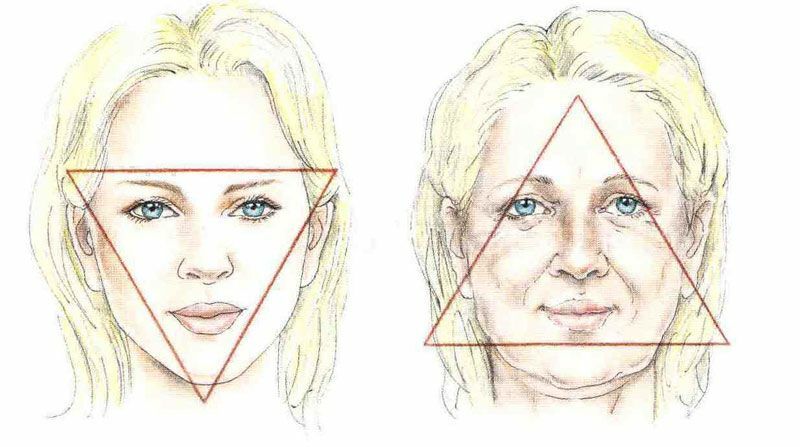 Regular facial gymnastics tightens muscles, allowing to achieve positive visual changes without surgery and injections. Simple, but very effective exercises for the muscles among natural cosmetics give a long-term and sustainable results without toxic injections and surgeon scalpels.